Anyone who knows me can confirm that I absolutely LOVE camping. I grew up going every summer with my family. Some of you may also know that I intentionally took the month of September off from filming weddings because I knew Adam and I had planned to travel for two weeks out of the month. After our first year of being completely immersed in the wedding business, we knew we would need a break before Adam started school (full time while also working full time) again in October. So, as a last hurrah, we decided to take a ten hour road trip so we could go camping in the Smoky Mountains at Cades Cove! Our trip to the Smokies was a lot of fun, but it was also a time of reflection for both of us. We had zero cell phone service all week (unless we made a trip into town) and because of that we were able to completely disconnect and focus on being present. 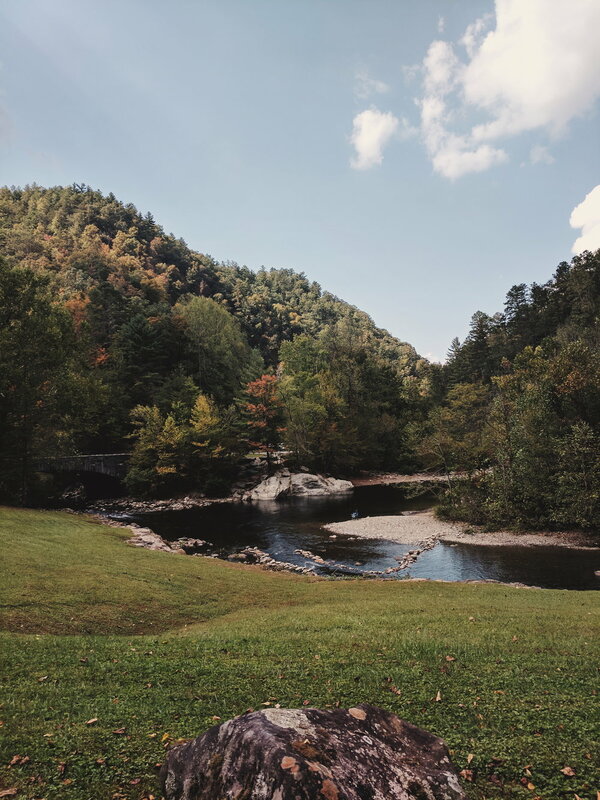 Here are a few things I learned while camping in the Smokies. 1) The best part about traveling is always the people. For the past 45 years (let me repeat that, 45 years) the Old Timers Club has been camping in the Smoky Mountains at Cades Cove. We happened to be there at the same time last week. One of my favorite moments from our trip was joining their annual Old Timers Dinner on Wednesday. Over 50 people gathered under a pavilion to share a meal and sing bluegrass together. It. Was. Amazing. They made us feel so welcome all week long and I'm so thankful to have been part of the old timers club for just one short week. How often do we miss the beauty right in from of us because we are too distracted to see it? Before I had a smart phone (I got my first smart phone in October of 2014), I was very aware of the beauty around me. I saw every little thing as a gift from God. When walking down the street, I'd notice the leaves and how they danced in the wind and it would cause my heart to worship the Lord. (I call those moments little gift nuggets) When I got a smart phone and had access to social media 24/7 I stopped seeing the beauty around me and started comparing my life to the lives of people I don't even know. If I was at home working and I saw someone else was on vacation in Italy, I would be disappointed in what my day looked like. If I was hiking in Wisconsin but saw that someone else was hiking in Colorado, suddenly my hike didn't seem as beautiful. I started to feel nothing but complacency about my own life. Don't we all do this to some extent? It's been a battle the last few years and there have been times when I've been really great about smart phone usage and times when I haven't. This trip reminded me of God's goodness in everything. If we're willing to have open eyes and open hands to the gifts God gives, we will live a much richer life. Even in the hard things, God is good. "Oh the vapor of it all It's a chasing of the wind The powers of the earth so pale and thin We will set our hearts on you again. Heaven taunts the hearts of men We can feel it from within The beauty of it all The mystery The swelling of a voice A rising sea .Holy You oh God are Holy Trees clap their hands for you Oceans they dance for you You are holy. Oh the mystery of it all I can never peer within I'll never find the words or understand The fullness of a God Become a man Holy You oh God are Holy Trees clap their hands for you Oceans they dance for you You are holy Infinite and holy A billion suns rise for you Clouds paint the skies for you Mountains stand tall for you Valleys bow down to you Everything rising to Sing all our songs for you Holy The impossible and holy Kings become fools for you Kingdoms to ruins for you Vapor finds ground in you Music finds sound for you Everything rising Everything rising Come like dawn Like waves Like sunlight Bring this world to life Come like rain Like breath Like springtime Bring this world to life"
We didn't plan anything for our time in Cades Cove. We wanted to have the freedom to do things with no schedule, that way we wouldn't feel pressured to see certain things or accomplish a certain number of hikes. We wanted to be spontaneous and make choices in the moment which ended up being a really great decision. One spontaneous decision was taking a 5 mile hike to see Abrams Falls. We saw the sign for the hike, which said it is usually a 3.5-4 our hike since some of the terrain is pretty steep, and since we hadn't planned anything for the afternoon, we were able to decide in that moment to pack a backpack with water and snacks and spend our afternoon hiking to Abrams Falls. One we got there, we waded in the water and Adam climbed the rocks next to the falls. Another spontaneous decision I made was to swim in the river. We were driving past a spot where it seemed like a lot of people were spending the afternoon climbing on rocks in the river and thought we would stop and try walking through the river too. Well, it turned out that parts of the river were deep enough to swim in, so I changed into my suit in the car so that I could get in. I've always loved swimming so it was one of my favorite moments because I felt so much like a kid again! On the last night we decided to get up early the next morning so that before heading back to Wisconsin we could make the trip from Cades Cove to Clingman's Dome near Gatlinburg. We knew it would add a couple of hours to the already 10 hour drive back to Wisconsin but we decided that seeing the view of the Smokies from Clingman's Dome would be worth it. It turns out, it was too cloudy to see anything from Clingman's Dome once we got there, but it still felt worth it. The drive up to the top was beautiful and we spent an hour or two in Gatlinburg for lunch after the dome.